The delicate Mixed Metals Bracelet is the result of combining size 11 seed beads and pearls. I have named the bracelet, Mixed Metals simply because the hues of the beads used look like various metals. 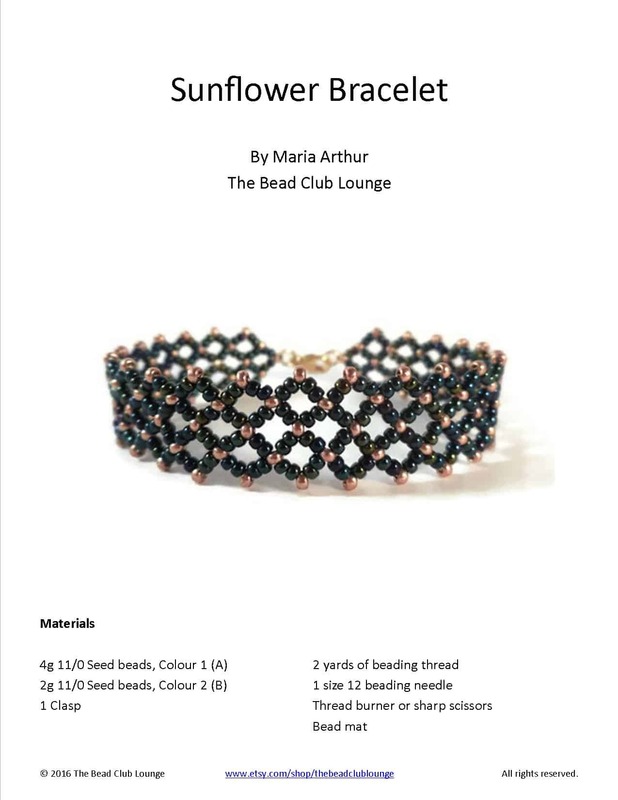 This beaded bracelet is made using Tubular Herringbone Stitch and I would recommend the tutorial for intermediate skill levels. Below is a materials list. Click any of the links to purchase the supplies required for this project. I have made both a video and a written tutorial for this beading pattern. Below is the full written tutorial. Step 1: Thread your needle with 3 yards of beading thread. Leaving a 10-inch tail, use 4A to create a row of Ladder Stitch that is one column high. If you are not familiar with Ladder Stitch, ﻿﻿﻿see this post﻿﻿﻿. Step 2: Go through the first 1A from the tail end. Step 3: Go through the last 1A from the side opposite the tail. Note: I have left my thread loose so it's easier for you to see. Step 4: Go through the first 1A from the tail end once more. Step 5: String 2B and pass through the following 1A. The beads will form a V-shape characteristic of Herringbone Stitch. Step 6: Pass through the next 1A from the tail end. Step 7: String 2A and go through 1A in the next column. Step 8: To add the next row, step up by passing through the 2A in the following column. Step 9: String 2B and go through the top 1A in the next column. Step 10: Go through the top 1A in the next column. Step 11: String 2B and pass through the top 1A in the following column. Step 12: To add the next row, step up by passing through the top 2A in the following column. Step 13: Repeat Steps 9-12 until you have completed 12 rows. Step 14: String 1B, 1A and 1B. Pass through the top 1A ​in the next column. Step 15: Pass through the top 1A in the following column. Step 16: String 1B, 1A and 1B. Pass through the top 1A in the next column. Step 17: To step up, go through the top 1A and 1B in the following column. Step 18: String 1C, 1A and 1C. Skip 1A (between the pair of B's) and pass through the ​next 1B. Step 19: Go through the 1B in the next column. Step 20: Repeat Step 18. Step 21: Step up by passing through the 1B and 1C in the next column. Skip the 1A between the pair of C's and go through the next 1C. Step 23: String 1A and pass through the next 1C. Step 24: Repeat Step 22. Step 25: String 1A and step up by passing through the following 1C and 1B. Step 26: String 2A. Go through the next 1B. Step 27: String 1A and go through the next 1B. Step 28: Repeat Step 26. Step 29: String 1A and step up through 1B and 1A in the next column. Step 30: Repeat Steps 9-29 until you have reached your desired length. Note: You will want to end your bracelet with a segment of A's. Step 31: Without adding any beads, pass through the top 1A in the next column. Step 32: Then, go through the top 1A in the following column. Step 33: Repeat Steps 31 and 32. Step 34: String 3A and one half of the clasp. Step 35: Go back through the last 1A strung. Step 36: String 2A. Go through the top 1A in the next column. Step 37: Attach the needle to the tail thread. Repeat Steps 34-36 to attach the other half of your clasp. Your bracelet is now complete! Enjoyed this Mixed Metals Bracelet tutorial? Shop our selection of easy-to-follow PDF beading patterns. Beautiful bracelet! I really want to try this one. Trying to go through my stash to find similar beeds. Could you tell me what colour Miyuki 11’s you are using? Thank you for the tutorial! Oh thank you! I used Miyuki 11/0 Galvanized Duracoat Muscat seed beads for this bracelet. This is an Amazon affiliate link for the same colour: http://amzn.to/2ft0Xj8. Feel free to email me a photo of your finished bracelet (maria@beadclublounge.com). I would love to see it!